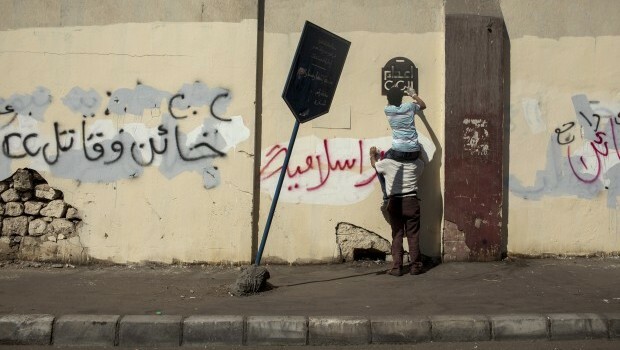 Supporters of deposed Egyptian President Mohammed Mursi spray slogans on a wall during a march through the Nasr City district on the second day of the Eid Al-Fitr holiday on August 9, 2013 in Cairo, Egypt. (Ed Giles/Getty Images). Last week, Egypt’s interior ministry issued repeated warnings to the massive pro-Mursi sit-ins in Cairo, calling on supporters to leave the squares and return to their homes. The expected violence failed to materialize, with supporters of the ousted president conducting Eid prayers in and around Rabaa Al-Adawiya Mosque, across town from supporters of the military-backed interim government who were celebrating the end of Ramadan in Tahrir Square. Despite the celebrations, Egypt remains on edge, with all sides waiting anxiously to find out just what will happen next. So, how can we ensure that Egypt does not descend into further violence? The answer is simple: Egypt needs to see the return of common sense to the scene. Egyptian defense minister and army chief Gen. Abdel-Fattah El-Sisi calling for mass demonstrations against “terrorism” in order to mandate the military to confront violence was either an act of pure irrationality or political Machiavellianism at its worst. In fact, the two are not mutually exclusive. Following a deadly incident during which scores of Muslim Brotherhood supporters were killed, allegedly while trying to storm the Republican Guard barracks were Mursi was being held, Sisi took the decision to call for more—not fewer—demonstrations. Rather than call for the Egyptian people to remain in their homes, he called on them to take to the streets. Unsurprisingly, Sisi’s call for a “no to violence” Friday in Tahrir Square at the end of July was met with Brotherhood calls for pro-Mursi counter-demonstrations. Even more unsurprisingly, the “no to violence” Friday ended in widespread violence, with heated clashes between Mursi supporters and security services killing at least 78 and injuring hundreds more. The Muslim Brotherhood estimated that more than one hundred were killed, reporting that the security services employed snipers and that the majority of those killed were shot to the head and chest. For its part, Egypt’s interior ministry denied that live ammunition was used, claiming that the Muslim Brotherhood had attacked the security forces, not the other way around. However, cover-ups are just not feasible during this era of digital media and citizen journalism. We have spent shell casings collected in Rabaa Al-Adawiya Square, and even images of snipers on roofs. It is unconceivable that the Egyptian authorities will be able to use violence to sweep away these pro-Mursi sit-ins and then cover up the violence from the eyes of the watching world. Thus the interior ministry and Egyptian military must realize that forcibly removing the Mursi supporters from Rabaa Al-Adawiya Square will only end in a bloodbath. One massacre will only lead to another, which in turn will lead to civil war and widespread violence. The Egyptian authorities must demonstrate patience and prudence to ensure that the country does not descend into the abyss. In short, they must do what everybody has failed to do since January 25 and take the long view, doing what is best for the country as a whole, rather than attempt to serve their own interests in the short-term. The continued presence of Muslim Brotherhood supporters in Rabaa Al-Adawiya and Al-Nahda squares, vociferously demanding the impossible—Mursi’s reinstatement—is also illogical. The Muslim Brotherhood must accept the new status quo and return to the political arena, or risk being shut out forever. They must understand that Egypt has changed and changed again, and just as they welcomed the first change, they must now accept the second. To do otherwise will not make anything better, and could make everything far worse. The Islamists had been divided, with the Salafist Nour Party initially supporting the military coup. Salafists of all stripes are now standing shoulder to shoulder with their Muslim Brotherhood brethren in Egypt’s squares and streets. This is an increasingly dangerous state of polarization, with two competing visions for the country’s government and future taking shape. In my opinion, both sides must retreat from their all-or-nothing positions and meet in the middle. A compromise will heave both sides dissatisfied, but Egypt’s Islamists and secularists need to reach just such a compromise. It would benefit of the country and the Egyptian people as a whole. What would be the ideal solution? The Egyptian people—secularists and Islamists—returning to their homes, allowing the country to return to stability and the military to return to their barracks. As for the interim government, it must understand that it is an interim government, and that its sole job is to steady the ship and prepare for the next stage. It must focus on holding free and fair elections, establishing a new government and selecting a new president. Has post-coup Egypt learned from the mistakes of its post-January 25 revolutionary past?